Wow. That's all I have to say about the past week. I had great plans to put up several blog posts and well that all got derailed. Very up and down week. Monday was the end of Spring Break & Elizabeth headed back to school. She got as far as the gas station. Brake light and 4 wheel drive light was on. Thankfully I was free to help get it to the mechanic and then take her to school Just really wasn't what I had planned for my afternoon but we had fun running errands together. Tuesday was our normal busy day of errands but I got to come home thanks to Jim & Suzanne taking over my chauffeur job. I used that time to work on grading papers & getting Megan's transcript going. It is a mess. Definitely one of those LARGE projects that will take time to get done. Wednesday we had a plumber over to verify some bad news. A few weeks ago we had water come in from a broken exterior faucet and Steve discovered that the pipes were not copper as we had been told when we bought the house. Bad news is that they are polybutylene which doesn't hold up to the cholorine that is in our water. It is a flood waiting to happen. He recommended putting new pipes throughout the house. Yes you read that right and yes I was hyperventilating by the time he was done talking. NOT something we want to do or can afford to do. Good news is the inspectors who checked the house when we bought came out that same afternoon. They realized right away that they missed the problem. They have insurance so now we are waiting to see how to proceed. Like I said up & down week. Thursday I got Elizabeth's car back from the mechanic and worked on plans for school for Joshua for the rest of the year. Sounds good right? Well due to my surgery in December we are farther behind that I would like. But now I have a plan to get it all finished up. This school year may have to roll right in to the next one without much of a break but that is okay. It amazing how getting to go swimming after school is done is EXTREMELY motivating. Elizabeth came home Thursday night for Easter weekend. She has been having some serious pain in her joints. It is not her Celiac disease and we are quite baffled by what is causing it. We contacted her doctor on Friday and Monday she has more blood tests. Hopefully she can get an appointment soon with a rheumatologist. If you think of her please pray that she can handle the plain until then and get some rest at night. Fatigue is dragging her down. Friday & Saturday we're fun days as the whole crew was home for Easter. Michael and Rebekah rolled in Friday for supper. It was a wii game night. Lots of fun! 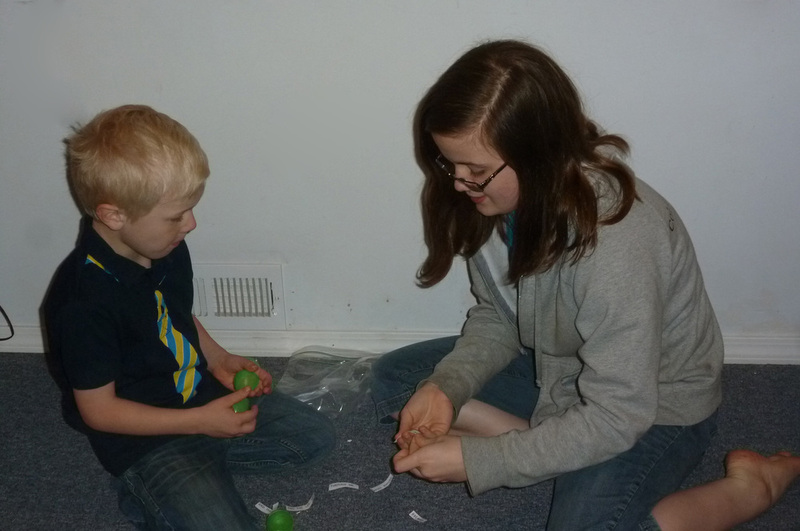 Saturday was more games and then headed to Jim & Suzanne's for an Easter egg hunt & dinner. Today we headed to sunrise service and church. Then we went to a second service with Elizabeth at the church she has been attending. It was glorious to get to praise God for his son who saved us by taking our sins to the cross. Nothing better than knowing his love has conquered the grave ans sin. So while our week wasn't very peaceful it ended with a lot of JOY!